Mr. John Albert “Kayo” Dottley, Sr., age 90, died on November 17, 2018 at Merit Health River Region Medical Center. Funeral services will be held on Tuesday, November 20th, at 2:00 p.m. at First Baptist Church with Dr. Matt Buckles officiating. Burial will follow in Cedar Hills Cemetery. Visitation will be Monday, November 19, from 4:30 p.m. to 7:30 p.m. at Glenwood Funeral Home. Mr. Dottley was born in Birmingham, AL on August 25, 1928. He grew up in McGehee, AR and was a Vicksburg resident for over 65 years, where he has been a faithful member of First Baptist Church. After graduating from McGehee High School, he headed to Ole Miss on a football scholarship. He graduated with an undergraduate and master’s degrees in administrative education in four years. While at Ole Miss, he met the love of his life and wife of 64 years, Nina Mae Nosser, his biggest cheerleader. He was a member of the Ole Miss Football Team, Kappa Sigma Fraternity, Ole Miss Hall of Fame, and Omicron Delta Kappa. He was Freshman King and elected Colonel Rebel. During his football career, he set nine Ole Miss records and three SEC records. He still holds the single-season rushing and yards per game records at Ole Miss. 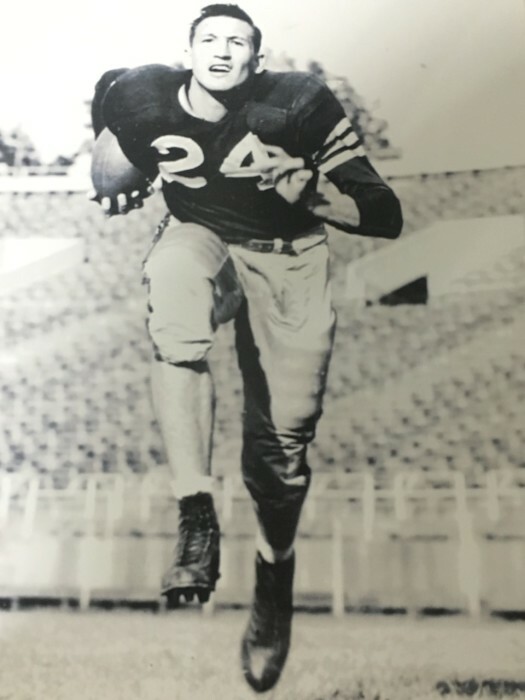 He was a two-time all SEC running back and led the nation in rushing with 1,312 yards in 1949. It stood as the single season record until 1977 and still stands as an Ole Miss record. He owns 3 of 7 of Ole Miss's 200-yard rushing games. He was first team All American. He was the 24th overall pick in the 1950 NFL draft by the Chicago Bears. While playing for the Bears, he was selected NFL Rookie of the Year, and the first rookie to ever make the Pro Bowl. Until his death, he was the oldest living Ole Miss All-American and Chicago Bear alumnae. He was selected a member of the Mississippi Sports Hall of Fame, Ole Miss Sports Hall of Fame, University of Mississippi Hall of Fame, Ole Miss Team of the Century, Arkansas Sports Hall of Fame, and as a SEC Living Legends in 1997. He was also a member of the All-American Football Foundation, Ole Miss Loyalty Foundation, Wahabi Temple, Aircraft Owners and Pilots Association, Ole Miss Alumni Association, as well as a board member for The Mississippi Sports Hall of Fame. Kayo was a successful businessman serving as chairman of the board of Dottley Spice Mart, and owner of Jitney Jungle for over forty years. He enjoyed coaching little league football and coached the Bowmar Bears for many years, making a lasting impact on many young men in Vicksburg. Kayo was an avid golfer and held the title of club champion at the Vicksburg Country Club. Kayo was preceded in death by his parents, Bill and Irene Dottley; his wife, Nina Nosser Dottley; his son John Albert Dottley Jr.; his great grandson, Robert Grant Houser III; his brothers, Paul Dottley, Charles McMichael, and sister Helen Johnson. He is survived by three daughters, Nina Dottley Rocconi (Larry), Debbie Dottley Brumitt (Woody), Dani Dottley Thomas (Gary), and one son, Billy Joe Dottley (Teresa); and a brother, Rev. Bobby Dottley; nine grandchildren, Larry Rocconi Jr., Courtney Rocconi Houser, Will Dottley, Jordan Dottley, Taylor Thomas, Rachel Thomas, Ann Garrison Thomas, John Tillman Thomas, and John Dottley III. Seven great grandchildren, Gray Houser, Sarah Jacobs Houser, Anne Marie Rocconi, Ellie Rocconi, Randall Dottley, Joey Dottley, and Bodie Sahler. The family wishes to thank Mr. Dottley’s loving and dedicated caregivers, Patricia Phelps, Mamie Ware, Mary Johnson, and Lori Black. Pallbearers will be Tim Dottley, Kevin Dottley, Paul Lewis Dottley, Chuck McMichael, Bill McRight Jr., Johnny McRight, Larry McRight, Rocky Nosser, Johnny Mims, Paul Mims, and Peter Mims. Honorary Pallbearers will be Dr. Bill Pierce, Bill Caldwell, Richard Marcus, Gene Allen, Dennis East, Otho Courtz, Robert Youngblood, Bobby Dunlop, Richard Price, and former players of Coach Dottley’s Bowmar Bearsl. Memorials may be made to Blair E. Batson, University of Mississippi Medical Center, c/o Public Affairs, 2500 North State St., Jackson, MS 39216 or First Baptist Church of Vicksburg, 1607 Cherry St., Vicksburg, MS 39180.